Back when I was doing Whole30, I invested a small amount of money and bought a spiralizer. Let me you…I love the thing. I started easy with zucchini and now I pretty much spiral all the things. Being fall, I’ve been doing a lot of sweet potato noodles and noodles from butternut squash. 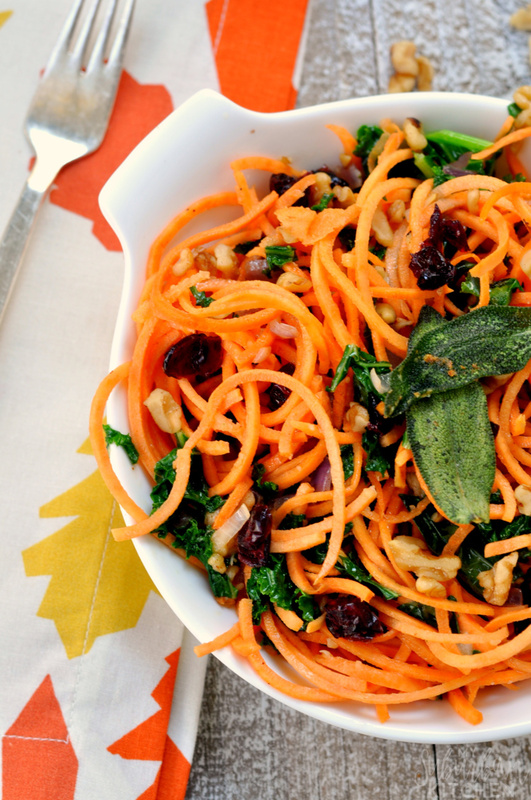 My current obsession is brown butter sweet potatoes noodles. This recipes makes an amazing main course but would also be awesome as a holiday side dish in place of the traditional sweet potato casserole. I keep it vegetarian here but you could easily toss in some chopped bacon pieces or crispy pancetta. Both would be so good. 1. In a small sauté pan, melt 2 Tbsp butter over medium heat. Add sage leaves and cook until crispy. Remove from pan and drain on paper towel. Set aside. Add onion to pan, season with salt and pepper, and cook until softened. 2. In a large pan, melt remaining stick of butter over medium heat. Cook, stirring frequently, for 3-5 minutes or until golden brown. 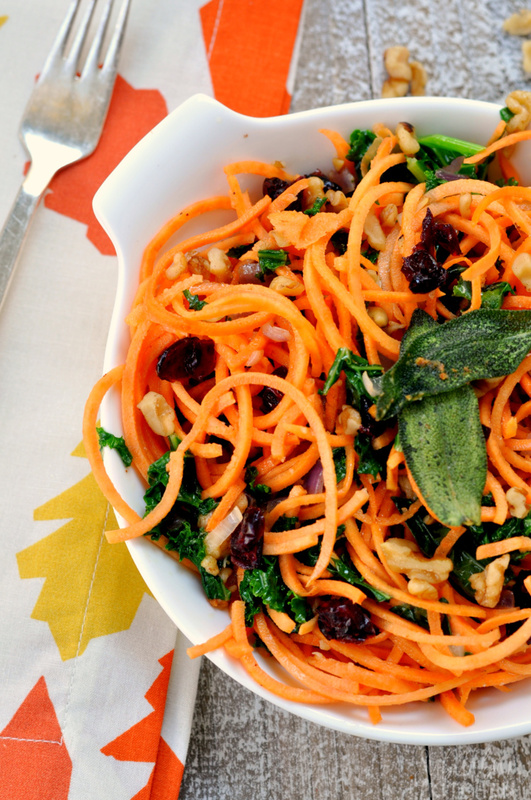 Add sweet potato noodles and kale to pan and toss to combine. Season with salt and pepper. Cook for 3-4 minutes. Remove from heat and add cooked onion, walnuts and cranberries. Toss to combine. Top with crispy sage leaves before serving. I like my “noodles” to be pretty firm so I don’t cook them for very long. If you prefer a softer texture, give them a little pre-cooking in the pan before you start browning the butter. If you don’t have kale on hand, you can substitute chopped spinach. Mathlete likes it with a little Parmesan grated on top too so, if you are cheese lover like he is, go for it! In a small sauté pan, melt 2 Tbsp butter over medium heat. Add sage leaves and cook until crispy. Remove from pan and drain on paper towel. Set aside. Add onion to pan, season with salt and pepper, and cook until softened. In a large pan, melt remaining stick of butter over medium heat. Cook, stirring frequently, for 3-5 minutes or until golden brown. 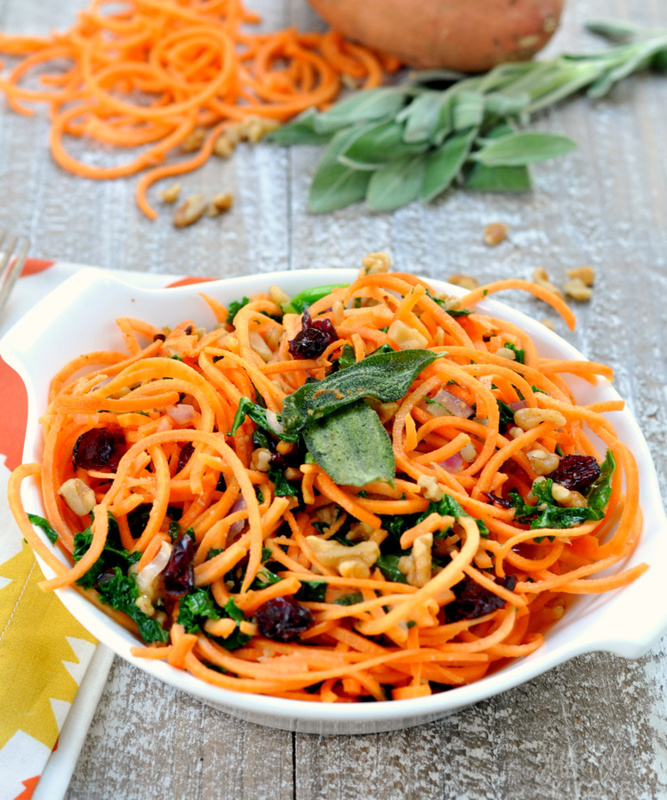 Add sweet potato noodles and kale to pan and toss to combine. Season with salt and pepper. Cook for 3-4 minutes. Remove from heat and add cooked onion, walnuts and cranberries. Toss to combine. Top with crispy sage leaves before serving. What a great way to serve sweet potatoes! Thanks for sharing on the What’s for Dinner link up and don’t forget to leave a comment at the party – Next week’s features that also leave a comment get pinned, yummed and tweeted! Oooh this looks so delicious and different!! Thanks for sharing at Share the Wealth Sunday, we hope to see you again this week! This looks delicious! I like the fact that it’s not something I’ve seen before. Thanks for sharing this amazing sweet potato recipe with us on Weekend Bites! We’re featuring it along with more healthy dishes. thanks for the recipe. Just pinned it. I like the idea of using sage, which I never use. That’s really sounds great & I love how easy it is! 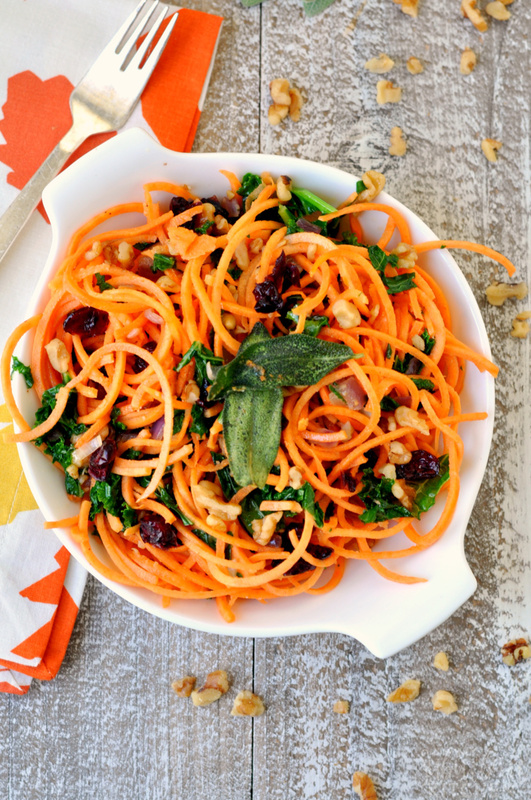 The sweet potatoes & Kale looks so good and I think the cranberries and walnuts add so much flavor to it. Thanks, Shannah for putting them together.